Turning 30 is a major turning point in an individual's life. It signifies the end of young adulthood and marks the beginning of a new era of exciting challenges that forms the foundation of wisdom. If you know someone who is approaching this special milestone, then a retro candy gift basket is a wonderful way to celebrate a time of innocence. There are a variety of gift baskets to suit just about every interest and need. 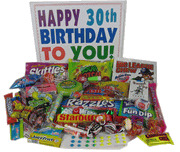 The 30th birthday gift basket is perfect for that special someone who is turning 30 soon. If you really want to make a lasting impression, try a gift basket that caters to their lifestyle. A sports retro candy gift basket would be ideal for the sports enthusiast in your life. These baskets are full of candy and other surprises; it's the gift that keeps on giving. Inside each basket is a plethora of assorted retro candy such as Smarties, Red Hots, and other nostalgic treats that will help the gift recipient remember the good old days. The loved one in your life who is turning 30 will also enjoy other included perks such as lotions, teddy bears, and chocolates. With these unique gift baskets, turning 30 doesn't have to be an agonizing experience. Help your loved one recapture the days when buying candy at the corner drug store on a Saturday afternoon was a cherished leisurely activity. Not only will these baskets bring joy to the gift recipient, they are the gifts that keep on giving. When someone is turning 50, it can be a milestone in life. Often friends and relatives hold an over the hill party for them. They like to tease them about their age. For many people this is a time of life that they enjoy much success. Their career is going great and the kids are starting to leave the nest. Many of these people have everything they want in life and finding an appropriate birthday gift can be hard. Most people love retro candy. It reminds them of when they were young. They think about those Saturday afternoons when they went to a matinee and enjoy some of their favorite candy. Often they spent their entire allowance on it. They savored every bite and couldn't wait for next Saturday to do the same thing over again. Most of the time, people never realized that candy changes. New things are introduced and old favorites are left by the wayside. But those sweet memories are fun to relive. 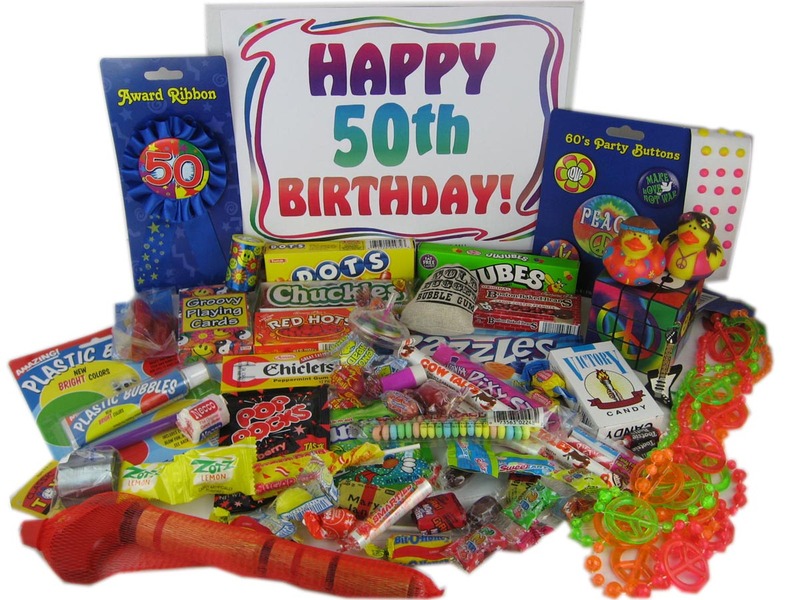 That is why a retro candy gift basket is the perfect thing for someone who is turning 50. They love seeing all the candy they use to eat as a child. Not only does it still taste the same, it brings back all those nostalgic memories. Anyone who wants to make someone happy on their special day should consider a 50th birthday gift basket. It might take a little bit of looking to find the candy that was popular 40 years ago, but there are companies that specialize in marketing these old time favorites. The wrappings look just like the original. Of course the price is a little higher, but the candy still brings the same smiles. Anyone who is having a birthday would enjoy this type of gift. Gift baskets are always appropriate and well loved. They can be full of anything and often they are centered around a theme. Some people like to put them together and others like them already assembled. Gift baskets are always a big hit and it is easy to see why. Retro candy is a novel idea, but a great one. This is a good way of honoring someone and still getting them a gift they will enjoy. It brings out the child in older adults. It is a great way to celebrate a 50th birthday. Buying a special gift for another person is certainly no easy task. With the advancement of modern technology and new devices being released every year, gift buying will not get any cheaper. Also, the receiver might be a little picky on the presents that he is going to receive. Fortunately, there is something that everyone will love, a special gift that will never go out of style: retro candy. This special treat allows a person to relive the special moment of his or her era. Giving that person a taste of the past will certainly tantalize his taste buds. 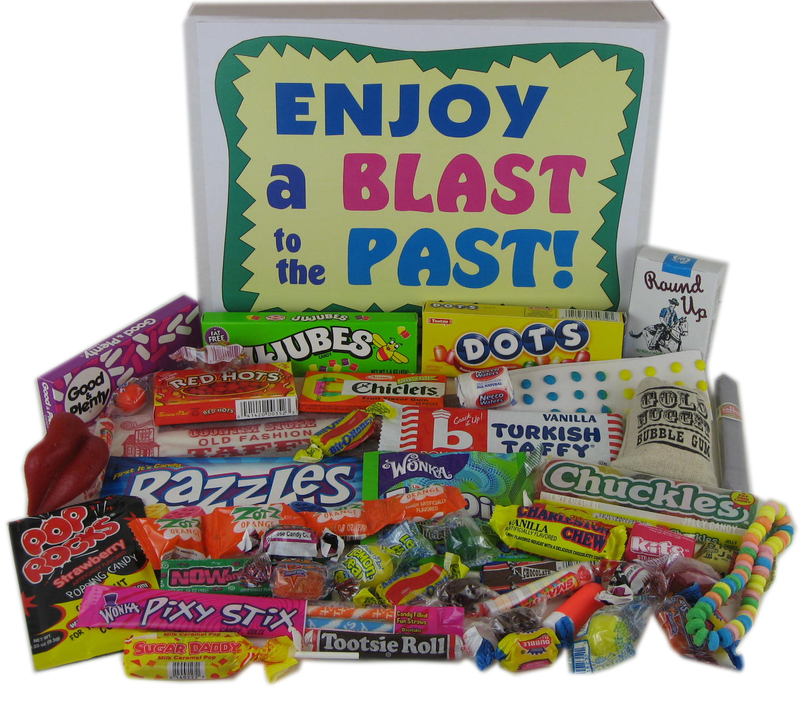 Most retro candy gift baskets have a delightful combination of retro candy going back for the past 50 years. Many candies of the past have fallen out of favor and for the most part, the younger generations have not even heard of these wonderful candies. Everyone is bound to have his own favorite candies of the past, the ones they indulged in during their childhood days. 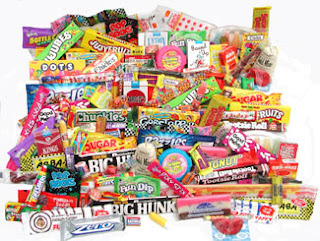 Some of the more popular retro candies include Boston Baked Beans, Atomic Fire Balls, Candy Dots, Jujubees, Laffy Taffy, Pop Rocks, Mary Jane Penny Candy, Donuckles and Zagnuts. These candies can be wrapped together into a big charming gift basket to be presented to friends and family members alike. Retro candy is so much fun to give and receive. Whether it is Christmas, Thanksgiving or someone's birthday party, retro candy gift baskets are suitable for all occasions and anniversaries. Each basket is infused with memories from a special year. These special gift baskets have been around since the early 90's and it has brought joy to the lives of countless individuals. These gifts are inexpensive, easy to prepare and people will experience sheer joy by just eating candy from yesteryear. So, one should not wait any longer when contemplating on what kind of gifts to buy for relatives and friends. Hop on the trend and get them some wonderful retro candy gift baskets from their era. They will be genuinely surprised, not to mention delighted, at just how wonderful good old time candy can be. It is a timeless gift that everyone will enjoy receiving. Ever wish you could enjoy the carefree days of being a kid again? You can enjoy experiencing those happy days again when you rediscover the many different retro toys you loved as a kid. Toys that were popular in the 1950s through the 1980s bring back memories of fun times with family and friends. Retro toys like Mr. Bill, Gumby and Mr. 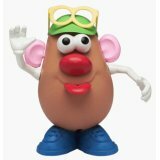 Potato Head allow children of all ages to draw on their creativity and imagination during playtime hours. Who can forget the wonderfully pliable and flexible Gumby, a figurine that could be bent into numerous positions, accompanied by his equally flexible horse pal Pokey? How many future make-up artists and beauticians started their careers by giving Mr. Potato Head as many different facial features as possible? And don't forget Mrs. Potato Head, who together with her husband, made for hours of creative enjoyment. Mr. Bill is another favorite retro toy made famous by "Saturday Night Live" where he endured many an "ooh, noo" moment. Rediscover the fun of building a replica of President Abraham Lincoln's boyhood log cabin using Lincoln Logs. Or create other building styles and architectural wonders with the versatile Tinker Toys. Little girls were captivated by the Easy Bake Oven which is now available in a new version which eliminates the light bulb heating element and safely heats up just like mom's oven in the kitchen. The 1980s saw the introduction of many low-tech computer toys such as Merlin and Simon, which were intriguing to play none the less even though they can't compare to the sophistication of today's computer games. On the opposite end of the spectrum are toys that are soft and cuddly, including the Koosh Ball, guaranteed not to break a window, the funny looking Sock Monkey, and Beanie Babies in every style imaginable. Predict the future with the Magic 8 Ball, whose message would appear in a small window located on the underside of the ball. But to really impress your friends, bring out your Slinky Dog and the original Slinky and watch how easily they can walk down the stairs. So the next time you need a birthday or holiday gift that's unique for anyone in the 40-plus age range or to introduce your own grandchildren to some really special toys, why not pass on the modern toys available these days and discover the fun of the retro toys you loved as a kid? Retro candy is an excellent alternative to party favors. Not only is it tasty, but it will lend a hand in adding sentimental value to the party. Retro candy can be picked out specifically to fit the age of your loved one and those closest to them in age. That way, they can enjoy a wide variety of candy from days gone by. 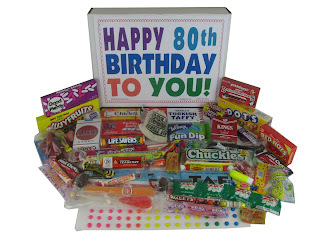 Another simple way to spice up your loved one's birthday is to give them an 80th birthday retro candy gift basket. It is also a great way to keep the spirit alive long after the party is over. It will also give them something to look forward to when they go home. Not to mention, the treats can be taken home and savored for several days to come. To give the party another element of fun, be sure to choose vintage decorations. Set the mood with older music and color schemes from their teen years. Try combining the worlds of vintage decorations and candy so you can pull off a memorable party that will be cherished for many more years to come. Now you have a series of tips and ideas that will help you pull off an amazing 80th birthday party that will be treasured by all who are involved. Special days that come in a person’s life are even more special when it is remembered by a loved one. The person celebrating the special day feels really great when a token of love is presented as a surprise gift on that day. They not only get the feeling of being remembered, but also that the gift represents something that the person likes, which makes the feeling even greater. Selecting a gift is quite a difficult task, particularly when it is picked up at short notice. This is where candy can come in handy. Almost everyone has a sweet tooth, and it has a lot to do with those carefree childhood days. Yearning for candies is something most people did as a child. Being presented with retro candy gift baskets would give that person receiving the gift that nostalgic feeling, which adds to ones feeling of happiness. The retro candy is a type of sweet that is not only good, but also tastes like it was made in the past. Those receiving retro candy gift baskets and tasting the retro candy can take a walk down memory lane. There are, of course, people who have issues like high sugar levels, which forbid them from consuming sweet products. For people that can’t tolerate an excess amount of sugar, Boston Baked Beans can be considered an alternative option. Boston baked Beans are prepared and packed in such a way that it allows for that same surprise element to the person whose special day is being celebrated. There are also the wax lips candy specials which would not only add the aspect of joy, but it would also bring fun and laughter to the loved one’s day. Shaped like the old painted lips, these wax lips candies look pretty humorous too. They can be enjoyed by both children and adults alike. There are other varieties also, such as Bit-O-Honey and Now and Laters Candy. These come boxed in attractive packages that would surprise the special person on their special day. Bit-O-Honey candy was originally made way back in 1924. It therefore would hold special meaning to people that are old enough to remember when it was first on the market. Now and Laters Candy, with their colorful packaging, would sure bring the person receiving the gift box back into the past years. Such varieties of retro candy, packaged in an appropriate manner, is the best and easiest way to select a gift for a person that one wishes to surprise on a special day. There are certain milestones in birthdays that require being remarked upon. The sweet sixteen for girls for instance, or the 21st birthday are big deals. The dreaded 30th birthday tends to be another important date in many people's lives. And of course, when you've finally left your youth behind, there's the dreaded over the hill birthday. It might vary from one person to another, but when that date comes around, it should not be left unremarked. 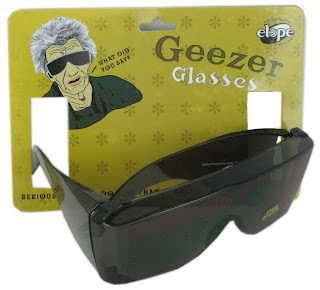 No over the hill birthday party would be complete without the requisite number of gag gifts; whether it's the geezer glasses, the bottles of fake medicine or even a telephone with ridiculously huge numbers on it. 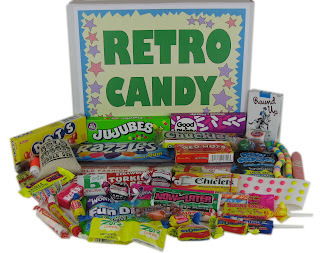 Or, if you can't decide which gift to get individually, then you might want to look at retro candy gift baskets. These handy items give you a wide variety of laughs that come with a little bit of sweetness to take the sting out of the joke. Gifts aren't the only things you can do for an over the hill birthday party. From the decorations to the cake, there's a lot of opportunity to do something memorable and hilarious. For instance, a crooked cane, or one in the shape of an old transistor radio might be something appropriate. Passing out buttons with large lettering so they could be read by stereotypically short sighted old folks are also an option. Even having someone show up dressed as the grim reaper to deliver a "see you soon" card could be the sort of thing that would make a party like this a memorable affair. There are all sorts of ideas for how you can make an over the hill birthday party a really memorable event. However, for many of the more extreme ideas and themes you're going to have to put in a lot of time and effort, even if you don't have to spend too much for your idea. For instance, you could have everyone show up dressed as very old people, offering "welcome to the club" gifts to the guest of honor. For those with a blacker sense of humor a party like a living funeral, complete with toasts and eulogies about what a fine person the birthday guest was in his youth. Trappings in black, and presents put in miniature coffins are all little touches that would make it an unforgettable party others will imitate. Turning 50 is a remarkable milestone, and calls for a unique and memorable celebration. Some welcome it while others feel self-conscious about it. As a result, finding a gift for someone turning 50 can be a bit challenging. Many of us love remembering our childhood as it gives us time to recapture moments of our youth. One of the best ways to usher in someone’s 50th birthday is to give them a chance to relive their childhood – to feel youthful again. 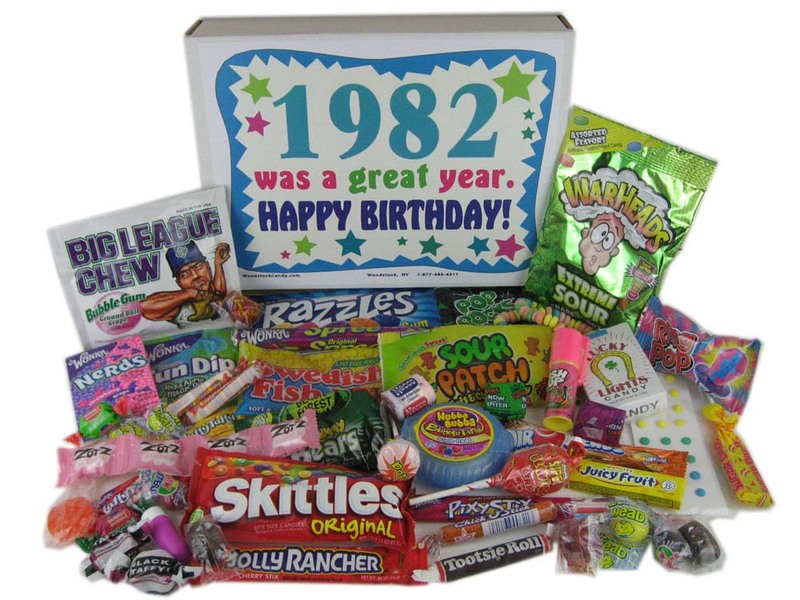 Because it’s the thought that counts, giving retro candy gift baskets as a birthday gift is an ingenious idea. Candy is a favorite among kids and adults alike. For kids, candy is part of our childhood memories. For adults, candy is the gateway to reliving that childhood. More importantly, candy from our childhood just tastes good! Giving 50th birthday retro candy gift baskets as 50th birthday gifts will make that birthday girl or birthday boy feel youthful. It also makes you look like a rock star for giving such a unique and thoughtful birthday gift! Retro candy gift baskets will have the recipient (and even partygoers) wanting to tear into it. It’s filled with all the sweet, good tasting candies that people from that era grew up eating. Your friend or loved one will be amazed to see that the 50th birthday retro candy gift basket has as many as 40 different kinds of candy! Notable mentions include Red Hots, Fun Dip, Pixy Stix, and Jujubes. It’s reminiscent of Halloween or Easter and makes them feel like kids all over again. There is a variety of themes for retro candy gift baskets. You can select a funny theme, poke fun about them being “over the hill,” impart a touch of inspiration, or present them with a fun and celebratory basket. Some of the basket selections include both retro candy and toys. Imagine having a basket of candies like Tootsie Rolls and Charleston Chews while playing with a Slinky or paddleball. Before you know it, everyone at the party (including the birthday boy or birthday girl) will be taken back in time. No one likes having to stay in the hospital. Bring your favorite patient a little bit of cheer with get well gift baskets! Tell your loved ones you care with a fun gift of candy and a thoughtful note to help them on the road to recovery. There’s nothing like a little nostalgia and whimsy in the form of a candy basket to send warm wishes to an ill friend. Get well candy gift baskets are a fun and sweet way to show you care. If someone you love is feeling under the weather or recovering from surgery, try a retro candy basket to remind them of the good old days! With a wide variety of nickel candy and treats you’d find at the corner drug store, a get well soon gift basket of retro candy is sure to bring a smile to any face! Mouth-watering treats like candy wax lips, dots, tootsie rolls and candy cigarettes will make anyone feel like a kid again! It’s tough to be in the hospital and tougher still on a kid! For a little one who’s not feeling well, there’s nothing like a gift box just loaded with candy to brighten her day. Order your favorite little patient a get well gift basket packed with sweets like Skittles, Ring Pops, button candy, Swedish Fish and Sour Patch Kids! Whether you choose a get well gift basket of retro candy, sweet and sour snacks or a mix of treats both new and old, you’ll be sure to brighten someone’s day. The next birthday that rolls around for a childhood friend could be a blast from the past with retro candy boxes or retro candy gift baskets. This is because the penny candies and other nostalgic favorites that once stood the test of time in the candy aisle at the local corner store are still being manufactured and distributed today. 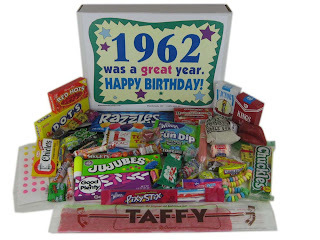 Always a favorite way to bring back childhood memories these retro candies are a perfect way to say “Happy Birthday”. These retro candies are fondly treasured by baby boomers around the world. Nothing brings on the nostalgia faster than a Coconut Long Boy or a chunk of Bonomo’s Turkish Taffy. Retro candies can be personalized and packaged together according to the era of their heydays. Candies from as far back as the early 1930’s can bring back, with one bite, the ambiance of the carefree days they were first introduced. The best gifts are sometimes the ones which recall the most cherished memories of one’s childhood. There are endless ways to customize a special birthday gift with retro candies. Available in birthday candy boxes and candy gift baskets, retro is once again the new style. As popular items like retro sunglasses, hats, toys, mugs, lunch boxes and gag gifts items are making their way back into the hearts and homes of people all over the world, retro candies are leading the way. A current trend with retro candies is using the candies in a birthday cake theme. This is definitely a way to ensure an unforgettable birthday. Retro candy cakes are as sweet as traditional birthday cakes, yet they are created with individual pieces of candies put together to resemble the shape of a birthday cake. These candy cakes are quickly becoming popular for those who have no time to bake and wish to customize a cake for a birthday party. All it takes is a little imagination and a bundle of retro candies from a favorite candy era to create a perfect personalized birthday cake. Celebrate the coming of age, or celebrate a life of long happy living with the retro styled gift baskets and retro styled candy boxes is a gift unto itself. Giving that special someone a retro style lunchbox or coffee mug, or a retro style candy birthday cake, its like giving them a piece of their childhood back. Say happy birthday from the heart and say it with retro candies and gifts. In today's fast-paced society, where we have smart phones, iPods and other technological gadgets, it's sometimes easy to forget how some of the simplest and nostalgic things, in life bring back simple pleasures and smiles. Things from our past bring back fond memories of fun and slower paced times. They also make very unique gifts for milestone birthdays or props for mystery dinner parties. Do you remember candy cigarettes, and how cool they were as a kid? You looked rough and tough with one of these candy coated sticks dangling out of your mouth. 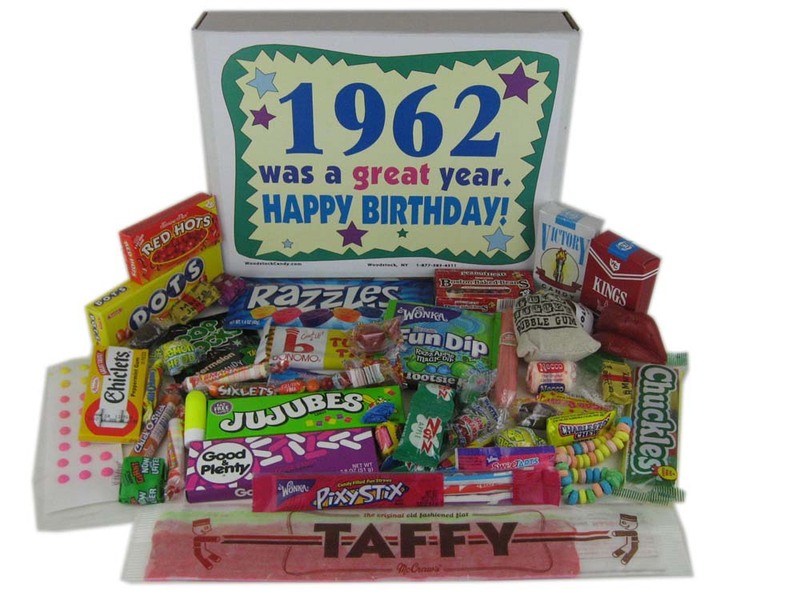 Candy cigarettes make a great gift when added to that 80th birthday gift package for your dad. Imagine your 80-year-old mom dangling a candy cigarette out of her mouth, as she mimics the actions of a military cigarette girl from the past. Or use these retro candies as an accessory for a murder mystery dinner party. It's the subtle small things that sometimes spark conversation. Another blast from the past that brings back simple and fond memories is that big spud with removable eyes, ears, nose and glasses. Yes, we're talking about Mr. Potato head toys. This iconic Hasbro toy has aged a few years since most adults played with them as girls and boys. This funny face kit was the first toy to ever be advertised on TV. In 2012, it celebrates its 60th birthday. You can celebrate too by adding Mr. Potato head toys to your child's gift list or that adult who has everything. Photos and children's drawings are often seen on refrigerators these days. Consider using a retro refrigerator magnet set to hold them in place. You can really stick anything you want on your refrigerator. Explore your sense of style. Be creative and have fun. How about hanging up those photos with album cover magnets? Your kids may ask who those album covers belong to. This gives you a chance to introduce them to music from the past. A refrigerator magnet set makes a great gift too. Give a special set to that crazy uncle who has everything under the sun. Nostalgic gifts make giving fun. They bring back fond memories and show someone you care about them. They're also great for someone that someone who already has everything. When someone you care for is ill or has surgery you naturally want to do something kind for them to show them that they are in your thoughts. Give them that message by sending gift baskets get well soon. There are number of ways that you can have a gift basket made. Get well soon gift baskets for her can be sent containing any number of things. You can send a woman a gift basket that contains bath and body products, her favorite magazines and books by a favored author or any number of items. Get well baskets for him can be done in a similar theme. You can go with things that you know he will enjoy. Perhaps place a couple of cds in that you know he will enjoy. Maybe a few DVD’s would be a nice addition. Gift baskets can be done a number of ways to give the message that the person who is ill or has had surgery is in your thoughts. When you are sending get well soon gift baskets for kids you have to think a little differently because children like different items than adults do. Items like coloring books and crayons are nice additions as are puzzles and craft kits. Candy gift baskets are a hit with children and adults too. You can't go wrong by sending candy gift baskets. You can order them the way you like and add the specific candies of your choice. Get well baskets for him can be done in the theme of candy gift baskets as well as get well soon giftbaskets for her or get well soon gift baskets for kids. Whatever you need gift basket get well soon for the person who receives them will be impressed by your thoughtfulness.